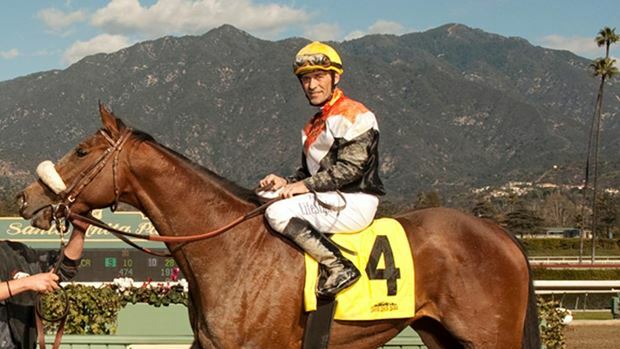 The Turf Publicists of America announced today that its membership has elected jockey Gary Stevens, winner of the 2013 Preakness Stakes and Breeders’ Cup Classic, as the recipient of this year’s Big Sport of Turfdom Award. The annual honor is bestowed upon a person or group of people who enhance coverage of Thoroughbred racing through cooperation with media and Thoroughbred racing publicists. Stevens, 50, returned to the saddle in January after seven years of retirement. He immediately re-established himself as one of racing’s elite riders, winning a graded stakes race within one month of his comeback, taking Santa Anita’s San Marcos Stakes on Slim Shadey. More success in racing’s premier events followed, as Stevens notched 17 graded stakes wins this year (through Nov. 14), including eight Grade I events. He won his third Preakness Stakes with Oxbow, his third Breeders’ Cup Distaff astride Beholder and his first Breeders’ Cup Classic aboard Mucho Macho Man. During retirement Stevens served as a racing analyst for NBC Sports and HorseRacing Television (HRTV). In an already storied career before injuries sidelined him in 2005, Stevens had won more than 5,000 races, including eight Triple Crown events and eight Breeders’ Cup races. The Big Sport of Turfdom Award will be presented at the Race Track Industry Program Awards Luncheon on Tuesday, December 10, emceed by Chris Lincoln. It is part of the 2013 Symposium on Racing & Gaming presented by the University of Arizona at the Westin La Paloma Resort in Tucson, Ariz. The TPA consists of approximately 150 publicity and marketing personnel from racetracks and racing organizations around the country. The Big Sport of Turfdom award has been presented every year since 1966. Previous winners of the Big Sport of Turfdom Award include jockeys Mike Smith, Pat Day, Laffit Pincay Jr., Chris McCarron, Bill Shoemaker, Angel Cordero Jr. and Eddie Arcaro; trainers Bob Baffert, D. Wayne Lukas, Jack Van Berg and last year’s winner, Dale Romans; as well as individuals who may not be involved in the day-to-day aspect of Thoroughbred racing but made significant contributions to the sport including author Laura Hillenbrand, broadcaster Jim McKay, and actors Tim Conway and Jack Klugman. The Awards Luncheon is included in the registration fees for the symposium. Additional information about the luncheon may be obtained by contacting TPA President Mandy Minger at (212) 366-7694.